February 8: William Beals Rogers was born to Joel and Priscilla Beals Rogers in Fayette County, OH. April 14: William married Cynthia Ann Buren. September 13: William mustered into the 44th MO Infantry by order of a commission received. August 9: The U.S. Federal Census enumerated in Trenton Township, Grundy County, MO showed William, a state senator, and Cynthia living with their young daughter Carrie. June 5: The U.S. Federal Census enumerated in Trenton Township, Grundy County, MO showed William, an editor, and Cynthia living with their 3 children. Also living with the family is Cynthia’s mother and sister. 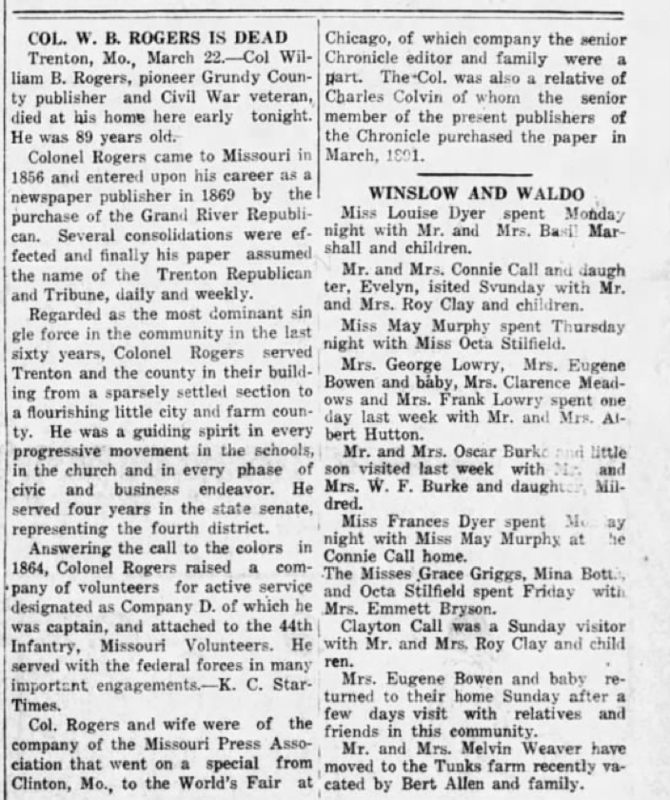 June 2: The U.S. Federal Census enumerated in Trenton Township, Grundy County, MO showed William, a journalist, and Cynthia and two of their adult children. April 21: The U.S. Federal Census enumerated in Trenton, Grundy County, MO showed William, an editor and publisher, and Cynthia living with their daughter, Carrie. August 21: William’s wife, Cynthia, died. ‘William B. Rogers was born in Fayette county, Ohio, February 8, 1835 where he remained with his father until his eighteenth year, his mother dying before he was six years of age, and accompanied him in his removal to Noble county, Indiana. He received a common school education in Fayete and Noble counties, which was afterward supplemented by one year’s attendance at Grand River College, at Edinburg, this county. Leaving Indiana. Mr. Rogers settled near Ravenna, Mercer county, Missouri, in 1856, and secured a position as school-teacher, and was subsequently engaged in the same work in Andrew county, Missouri and Wayne county, Iowa, and also officiated as assistant instructor while pursuing his studies at the Grand River College. His last work in this capacity was a Princetion, Mercer county, where he taught school for fifteen months. This brought him up to the year 1861, when the country was thrilled by the prospect of war, and in August he enlisted in the State service, serving six months under Lieutenant-colonel Jonas J. Clark. Returning home, he was elected sheriff and collector of Mercer county, in the fall of 1869, and while acting in that capacity was commissioned colonel of the enrolled militia of that county, by Gov. H. R. Gamble. Before the expiration of his term as sheriff, he raised a company for the United States service, which became company D of the Forty-fourth regiment of Missouri volunteers, of which he was elected captain, Col. R. C. Bradshaw (now of St. Joseph) commanding. He received his commission from Gov. W. P. Hall, and served until the close of the war, participating in the battles of Franklin, Spring Hill and Nashville, in Tennessee, and the ccapture of Mobile, Alabama. He was mustered out of the service in 1865 and returned to Mercer county and engaged in the mercantile business at Ravenna until 1868, when, he was elected to the State senate, from the Fifth senatorial district, composed of the counties of Livingston, Grundy, Mercer and Carroll, and honorably acquitted himself of the duties of the position during his term of four years. In September, 1869, he moved to Trenton and purchased the Grand River Republican, which name he changed to Trenton Republican, July 25th, 1872.